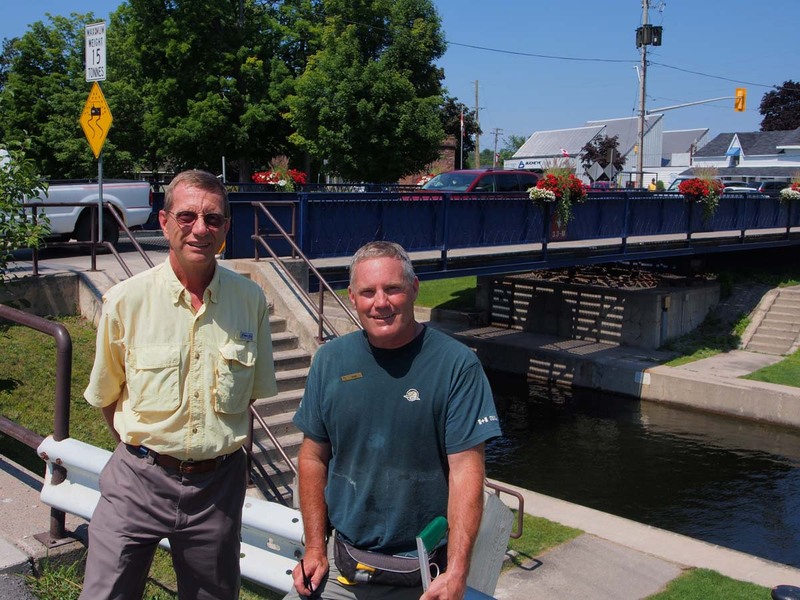 With the lock master for lock 32, the busiest lock on the Trent-Severn system. Today I got our rental car in Lindsay in the morning, visited an optometrist to check on my glasses prescription and stopped by lock 33, which is in Lindsay and off our route, just to see it. The lock 32 master, who was able to squeeze me in yesterday, was visiting there and I got to talk to him a bit more. All the employees in the canal system do a great job. I told him that and that as much as I appreciate my locking vacation being financed by the Canadian taxpayer, I do believe in user fees paying the freight and that they should raise their rates. Finally I drove to the Toronto airport to get Sharon and Paul. Sue stayed and arranged the boat for Sharon and Paul’s arrival. She got the better deal. Toronto traffic was the worst I have been in anywhere for quite awhile, and that was at 3 in the afternoon. Toronto is the largest city in Canada by far and I’m really glad to be out of there. 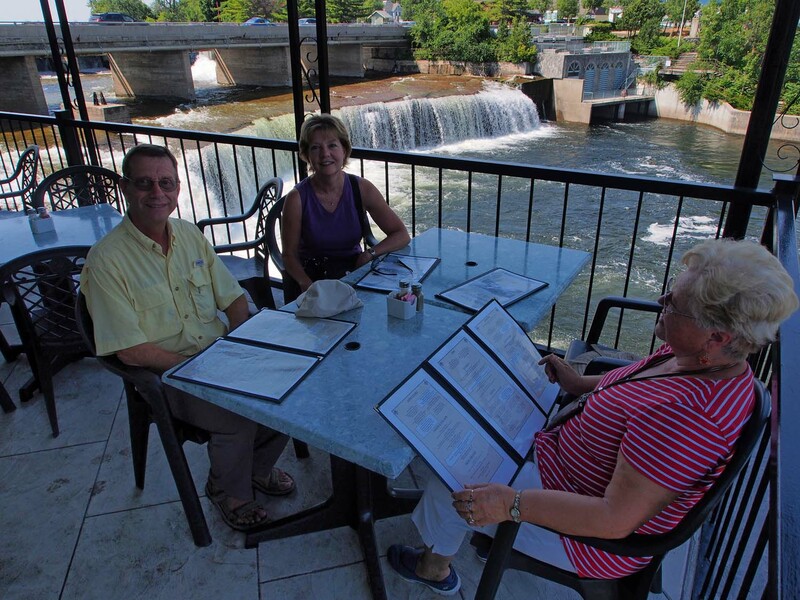 At the restaurant on the river at Fenelon Falls. The canal and locks are on the other side of the powerhouse. We kept the rental car for Tuesday so the four of us could look around the area. We toured Bobcaygeon, which was a nice little tourist town, and stocked up our groceries and a supermarket there. Paul and I also ran into the lock master again and talked more. We then drove over to Fenelon Falls. Lock 34 that we’ll rise 26 feet in early Wednesday is there as well as a restaurant that overlooks the falls beside the small powerhouse where we ate lunch. With our car touring ended we dropped the women at the boat and Paul and I drove into Lindsay to drop off the car. While in Lindsay on Monday I ran into Ron Foster who learned I could use a ride to Bobcaygeon this afternoon late. He had to make the same run and would make it at the right time, so that’s how Paul and I got back to the boat. 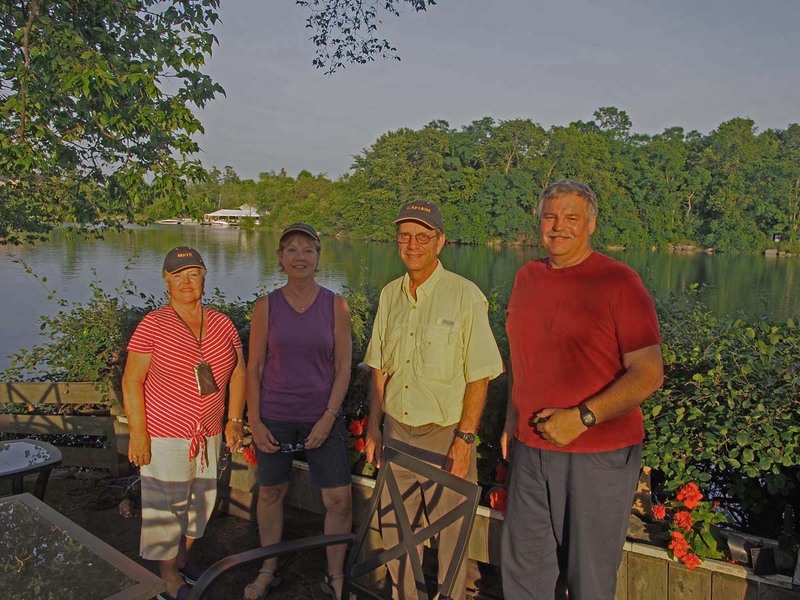 The weather up here has been outstanding, and today was just another example of that, which maybe inspired Ron to invite us out on his boat for a tour of northern Pigeon Lake. 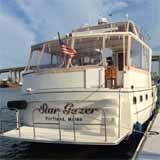 Ron Foster at his home before our evening cruise. We saw where the town luminaries lived along the lakeshore and learned a bit about the history and geography of the area. Ron was born here and lived most of his young and older life here. It was warm right into the twilight with a three quarter moon lighting our way. We got back to Ron’s island and home at dark, being entertained by following someone apparently learning to drive a large rental houseboat going almost into the shore on one side and then the other on the way back into the harbor. 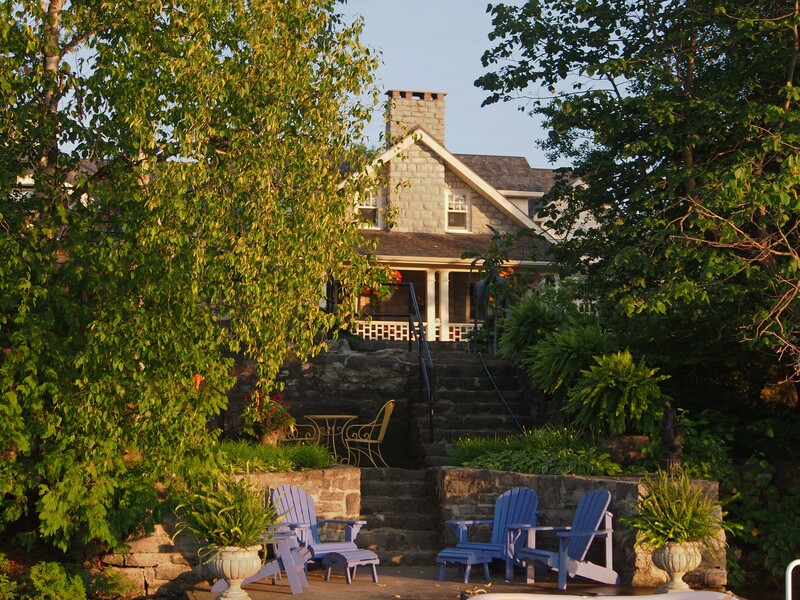 One of the Bobcaygeon water front homes we saw on our evening cruise. Ron dropped us back at our boat and we had a quick small dinner and went to bed. Big day tomorrow. Quite a few locks. Now that Paul is back, he is reassuming position of official voyage photographer. Most pictures are his.